Huber's is your Mercedes service repair specialist, serving customers in Reading, Ephrata, & Lancaster, PA.
As your "Mercedes Dealer alternative" Huber's Auto Group takes particular care to complete all scheduled maintenance according to manufacturer's specifications. Huber's has factory diagnostic scan tools for resetting maintenance reminders, and computer record keeping that is reported o Carfax, so your car has maintenance history that will keep your factory warranty intact. Huber's services all Mercedes models from C-class, E-class and S-class cars, to Mercedes GL SUV's Diesel or gas. Huber's also services Mercedes-Benz Sprinters. Our new facility now allows us to easily complete Mercedes Sprinter cargo van service, and Mercedes Sprinter passenger van service. 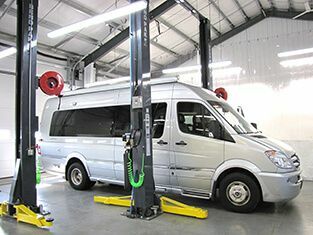 Our new heavy duty lifts and factory scan tools make us your best option for complete proper Mercedes Sprinter diagnostics. You can trust Huber's for any Merecedes Diesel Sprinter van repair. Mercedes are very reliable but like any machine do they require regular maintenance and service. To often we have to do major repairs because of incorrect and negligent maintenance. That is why we provide our Mercedes service repair specialists with training and tools to complete the complex task of proper preventive maintenance, providing you with Mercedes dealership level service and repair. We are careful to use quality German filters and the factory specified synthetic oil and fluids for your Mercedes, and provide a 12 month warranty on all parts. We also include a free 43 point safety and maintenance check with every service to ensure you don't have to come back any time soon. Huber's also offers Hunter Road force balancing to ensure a smooth ride for all tires. Road force balancing is especially beneficial in low profile and run flat tires that come on your Mercedes. 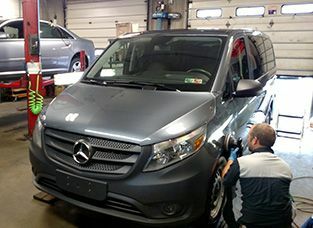 For all of your Mercedes service repair specialist needs in Lancaster or Reading, PA, contact Huber's Auto today! We service and sell Mercedes-Benz, and we will give you the same level of service and value no matter where you bought your Mercedes. As your Mercedes dealer alternative we will never do work you haven't authorized and guarantee our estimates. Please contact us if you have any questions about service and repairs on your Mercedes. You can count on Huber's Auto to be your Mercedes service repair specialist throughout Reading and Lancaster, PA!